For puppies, elderly, infirm, shy or low energy dogs, Lucky Dog offers a 20 minute solo dog walk. The pace and length of the walk is personalized to suit your dog's temperment. A second visit per day is $10. We offer 40 minute group walks to socialize with compatible dogs. 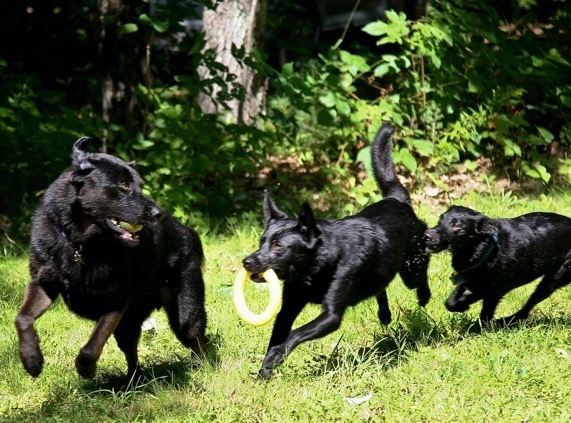 We limit group size to three clients so we can be sure your dog gets individual attention, always supervised and safe. You can provide written consent for leash free walks. Dogs are pre-screened for temperament, compatibility and he/she must be 6 months or older; licensed and have an identification tag; spayed or neutered; current on all vaccinations including: Rabies, Bordatella (kennel cough), Distemper/Parvo (DHPP). Lucky Dog can care for your pet in a private home while you are away. Pricing starts at $45 per day for one dog. There may be an additional charge for busy holiday weeks. For cats and other small animals that remain at home when you are away, Lucky Dog offers feeding, fresh water, litter cleanup and cuddles. Tailored to your needs, we can also help make your home looked occupied, with mail and newspaper retrieval, plant watering and garbage disposal. Let us know how we can help. Lucky Dog offers a prepaid package of 20 walks to be used in 45 consecutive days at a 10% discount off the regular rate. Please Note: All rates are subject to change based on availability or special circumstances.